Bitcoin zonder internet! Offline Bitcoin transacties uitvoeren? Hoe kan ik zonder internet offline bitcoin transacties uitzenden en verwerken? Bitcoin zonder internet? Er zijn verschillende methodes om Bitcoin transacties onafhankelijk te maken van het internet. Er zijn al testen geweest met radio golven en er is al technologie om Bitcoin transacties via een mesh netwerk te verzenden. De ontwikkelaars van de Samourai Wallet hebben dit voor elkaar gekregen met goTenna. Ze hebben een TxTenna ontwikkeld waardoor het versturen van bitcointransacties mogelijk is zonder een directe internetverbinding. Verder is de OpenDime een alternatieve manier om zonder internet bitcoins te kunnen gebruiken als een betalingsmethode. Niettemin, de belangrijkste doorslaggevende methode om Bitcoin internet onafhankelijk te maken is door gebruik te maken van een satelliet. Dankzij de lancering en activering van Blockstream Satellite project is het mogelijk Bitcoin transacties zonder internet te verwezenlijken. Dit is vooral handig in gebieden die niet over internet beschikken of daar waar een snelle internetverbinding te duur is. Het versturen van Bitcoin transacties via een satellietverbinding kan veel goedkoper zijn. Via een goedkope setup kan iedereen waar dan ook op de wereld een deel worden van het Bitcoin netwerk zonder internet. Het is mogelijk om zonder vertrouwen en derde partijen Bitcoin transactieblokken te verifiëren en te verwerken. With the Satellite API, those same areas can now receive arbitrary data — current market data, private messages, and data from exciting new use cases not thought of yet. All free. The broadcasts are free and the software is free with code available for auditing and improvement by the community. For the first time, most of the planet’s population can receive bitcoin using their own fully validating nodes without expensive data plans. 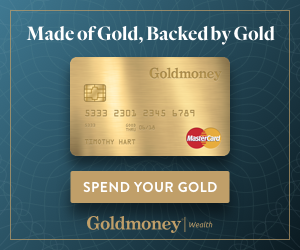 But how do they send bitcoin? There are a few cheap and accessible ways to do so. Transactions can be broadcasted via SMS, by mesh networking devices, and even sneakernet (simply transporting the signed raw transaction data on a flash drive or printed QR code). GoTenna sells a simple to use mesh networking device, which along with a piece of software called TxTenna can broadcast Bitcoin transactions to a local mesh network of GoTennas. There is also growing interest and work being done on LoRaWAN — a similar mesh networking technology. With this hardware setup, anyone can send and receive bitcoin without an internet connection. It’s resistant to network outages and can also maintain uptime through power outages since all of the hardware is run off batteries. The hardware can of course be run off of gasoline generators or solar panels if the power outage is longer lasting. If you want to use a hardware wallet, Electrum supports most of the popular offerings: Trezor, Ledger, Coldcard, and possibly even OpenDIME. 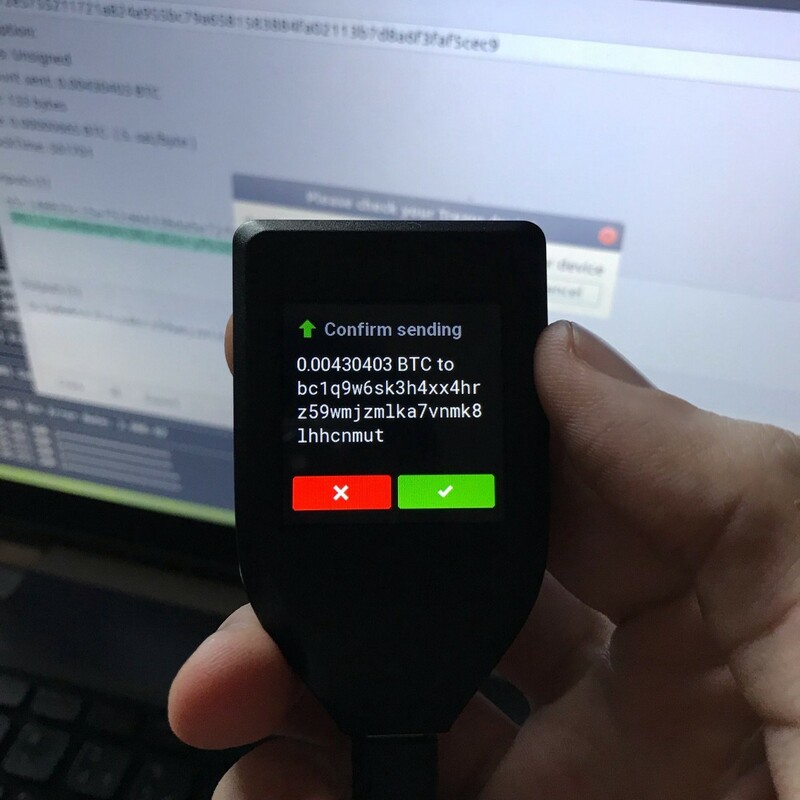 For this tutorial / demo, I used a Trezor Model T.
Now we want to spend some of our BTC. With available tools and software, we can broadcast a signed raw transaction via a local mesh network. GoTennas have a range of up to 4 miles depending on your local geography and “density” — forested areas or urban areas with buildings will reduce the range of the GoTenna. There are ways to modify the GoTenna to attach external antennas for longer range communications. Note that you can broadcast transactions multiple times if you don’t succeed the first time. You could also always save the raw transaction onto your mobile device and carry it to a location where you’re within range, or fall back to broadcasting via SMS. Combining GoTenna hardware with a piece of software called TxTenna enables Bitcoin transaction broadcasting and relaying without cellular network nor WiFi connectivity. TxTenna also supports transaction relay via SMS. 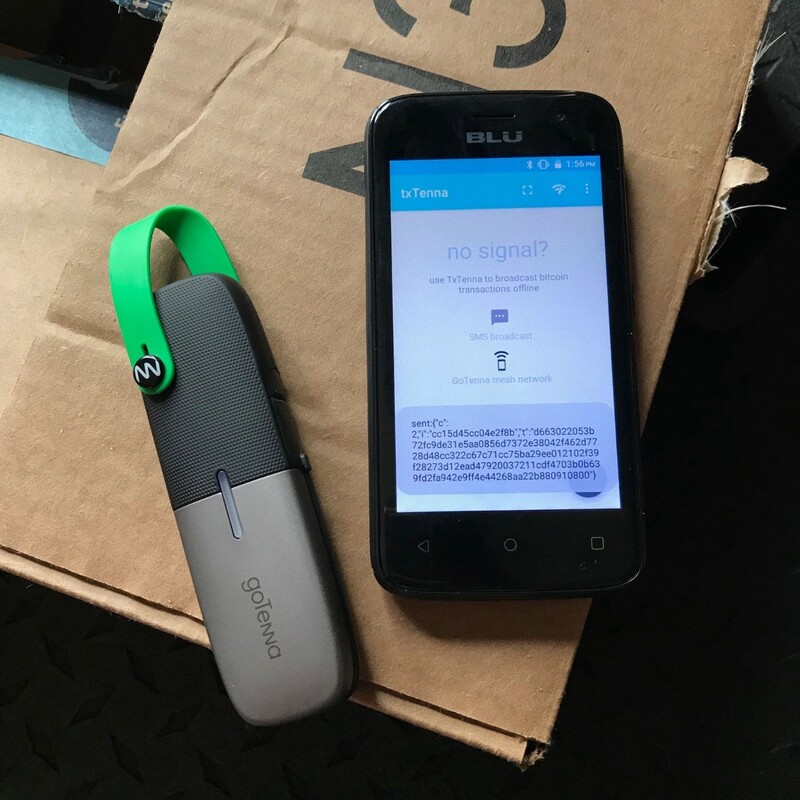 Simply download the TxTenna app on your Android smartphone using Google Play or other means, and pair your GoTenna with Bluetooth. 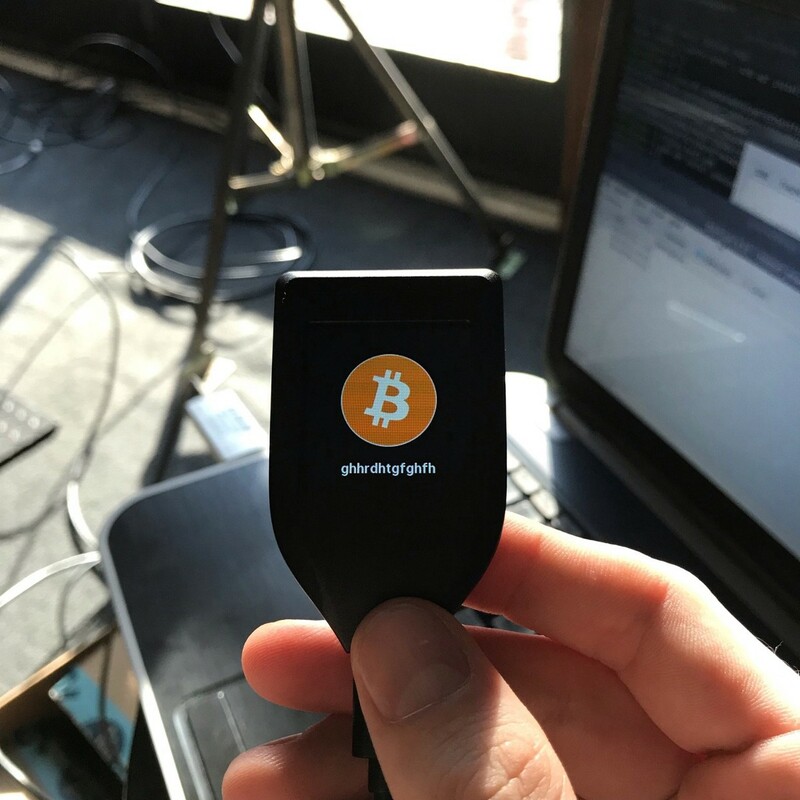 Using Electrum Wallet, Bitcoin transactions can be signed with a hardware wallet device and saved locally to be converted into a QR code. To do so, sign the Bitcoin transaction with Electrum like you normally would, but don’t broadcast it with Electrum. 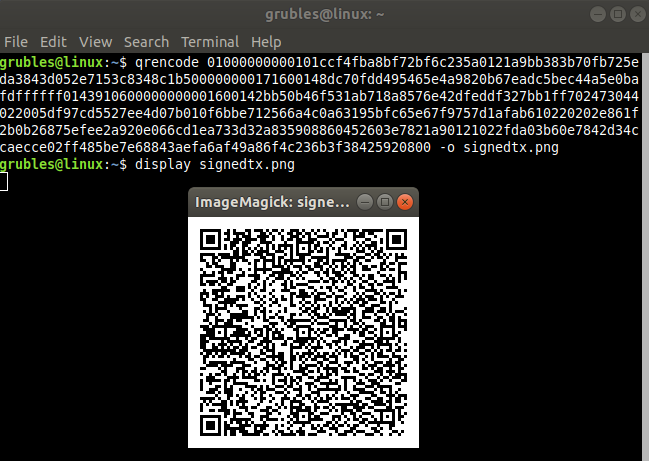 Once signed, you can click “Copy” at the bottom left of the Electrum UI to copy the raw transaction hex in order to generate a QR code. 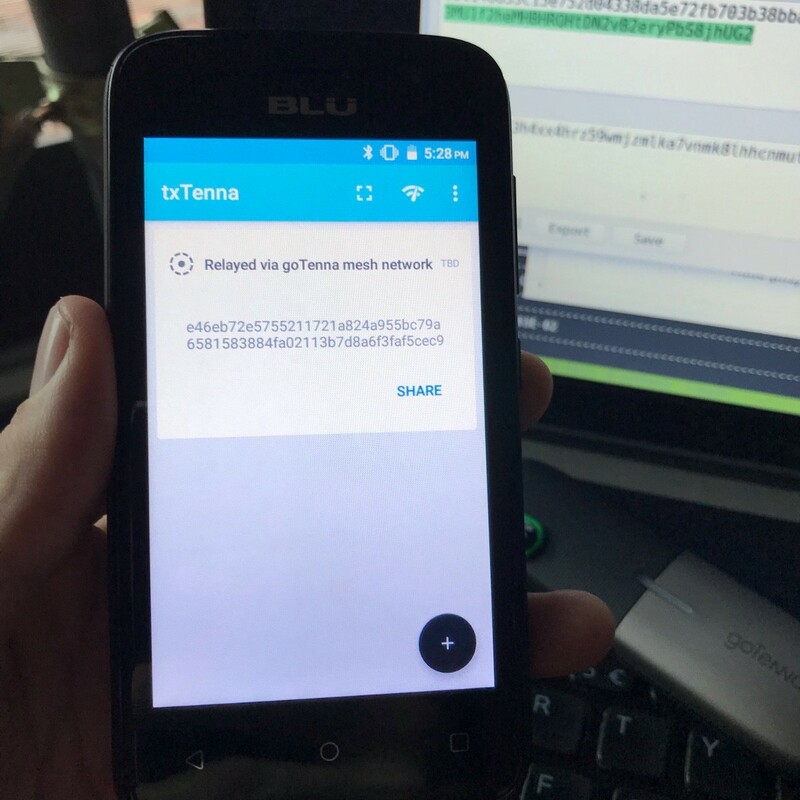 Now you’re set to scan the QR code with the TxTenna app and broadcast it to your local mesh network where it will eventually make its way to the TxTenna API endpoint. The transaction is now broadcasted to the mesh network! 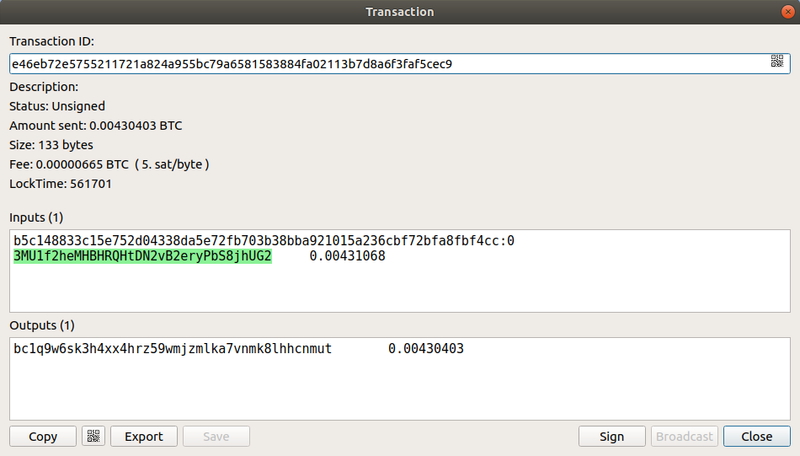 Once the transaction is included in a block, your offline satnode will display the transaction in Electrum Wallet. I run a Blockstream Satellite Receiver which receives Bitcoin data and arbitrary data broadcasted by the Satellite API. An anonymous person in some undisclosed location broadcasted a journal and BTC address. Using their BTC address, I generated an offline transaction with my satnode, signed it with a hardware wallet, and finally broadcasted it outbound to my local mesh network. 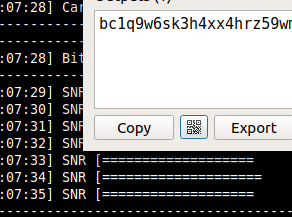 The transaction was included in a block, beamed down from space, and my satnode verified the data. 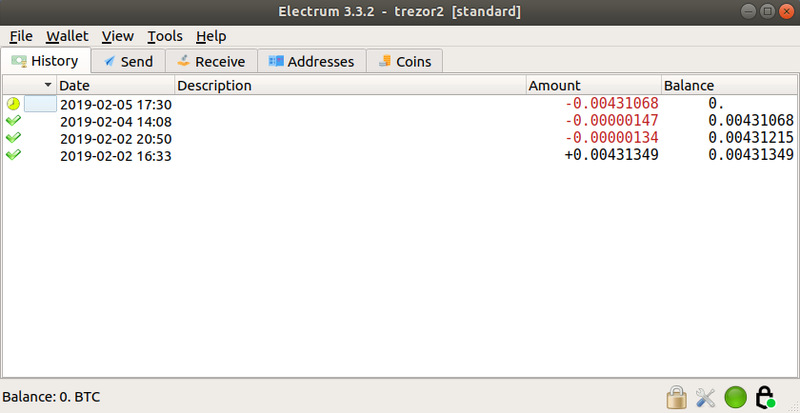 Electrum Wallet displayed the transaction as confirmed! Leer alles over Bitcoin met behulp van onze Bitcoin cursus en referentiepagina over alle mogelijke Bitcoin onderwerpen!